This year’s brief setter is Donna Wilson. Donna Wilson is a Scottish textile designer with her own brand of cushions, creatures, sweaters, scarves and ceramics. 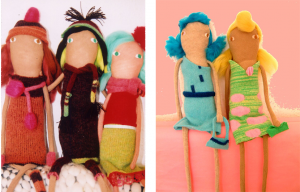 She has been happily designing and making colourful creatures and odd objects for people and their homes since 2003. Donna left school to do a degree in textiles at the Gray’s School of Art in Aberdeen and later studied an MA in Constructed Textiles at the Royal College of Art in London. It was here that she created her first knitted creatures for which she is best known. 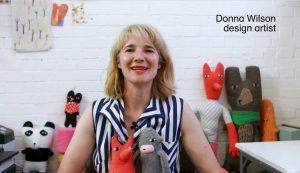 Donna always knew that she wanted to run her own business and, at the Royal College of Art, she started to create Donna Dolls, long, leggy textile dolls made from recycled jumpers. Each one was handmade and unique, with their own hair do and outfit to fit the season. Her tutor suggested that she show them to local shops to see if they’d be interested in stocking them. From this, came her first ever customer: London boutique, Couverture and the Garbstore who bought twenty dolls a month. After the success of the Donna Dolls, Donna started to think about how she could develop them into a new product. She was inspired by children’s drawings, where it doesn’t matter how many legs or arms or eyes you draw, it’s just spontaneous, creative and free. It was this that inspired her first creatures. Made by hand, each knitted creature is unique. While it always started with the design, right from the beginning the creatures’ names and personalities were very important to Donna. Each one came with a tag or keyring with information about them, such as Ed Redd Head who is super intelligent and dislikes sports but loves cuddles. Donna sold these creatures at her degree show and, after graduation, took part in a design show in Japan. By the time she got home from her trip, there were numerous orders for her animal scarves and knitted creatures, particularly the weirder-looking ones. Japan quickly became one of her biggest markets. Soon after this, contemporary design company SCP took an interest in her products, and started to sell her creatures, cushions, blankets, furniture and rugs. Donna began to work with bigger high street brands such as John Lewis and Liberty. Despite this growing demand; however, she chose to keep production to a small scale so as to maintain the handcrafted appeal that she believes makes her work so popular. Donna has always felt strongly about keeping her work handmade in the United Kingdom to help keep British craftsmanship alive, and even now when she makes a big batch of Cyril Squirrel Foxes, (her favourite design) they will all have a slightly different expression. Donna also believes that there is too much disposability in products and consumer goods and aims to create things that people use, keep and treasure for years, things that don’t end up in a landfill. With this ethos in mind, she has set up a Creature Clinic to repair well loved, injured creatures for free. Today, Donna works from her studio in Bethnal Green, East London with a small group of employees. Donna still does much of the designing herself and the process hasn’t changed much over the years. 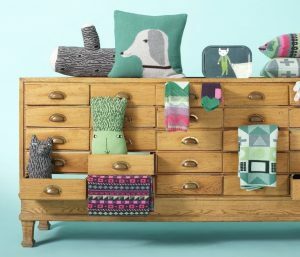 Donna’s creatures have now been joined by a whole host of other products including contemporary furniture, homewares, textiles, clothing, and even confectionery. You’ll find her work for sale in over 30 countries around the world! Over the past ten years Donna has been named ‘Designer of the Year’ at Elle Decoration’s British Design Awards, exhibited a solo show of knitted sculptures and paintings entitled Endangered Species at the Yorkshire Sculpture Park, written a book of knitting patterns entitled 35 Knitted Animals and other Creatures, created a line of childrenswear for UK retailer John Lewis and, most recently, designer her very own line of womenswear. Donna will be part of the expert judging panel for this year’s Design Ventura Pitching Day in December. We can’t think of anyone better to help to choose the winner of Design Ventura 2018!